Joseph Howard Hinshaw1,3 [Howard Hinshaw4]. He married Madeline Heise, Sep 20 1925.1,7 Madeline was born May 3 18936 [May - 18928, about 18957], Illinois6. Hinshaw, Joseph H., head-of-household, age 40, born in Illinois; father born in Indiana; mother born in Illinois; first married at age 35; occupation: lawyer, law; World War I veteran. Hinshaw, Madaline, wife, age 35, born in Illinois; father born in Germany; mother born in England; first married at age 30; rented home ($75 rent); radio in home. Heise, Edward, head-of-household, age 43, born in Illinois; father born in Germany; mother born in England; owned home ($15,000 value); single; occupation: adjuster, insurance; not a veteran. Heise, Katheryn, mother, age 78, born in England; parents born in England; immigrated 1870; widow. Murtagh, Mary, servant, age 20, born in Ireland; parents born in Ireland; immigrated 1928; single; occupation: servant, private family. In the 1930s, after saving up $300, an amount which he deemed sufficient, Joseph Howard Hinshaw, a legendary trial lawyer, decides to establish his own law firm. In 1934, Hinshaw and James G. Culbertson, a renowned banking and corporate transactional lawyer who was referred Clarence Darrow's transactional work, begin a law firm partnership on LaSalle Street in Chicago called "Hinshaw & Culbertson." The unique coupling of Hinshaw's trial expertise and Culbertson's "flair for the numbers" was a potent force. Joseph Howard Hinshaw, lawyer, born Stonefort, IL Sept. 19, 1890, son of William Riley and Fanny Neely Hinshaw graduated Harrisburg, IL. TWP H.S. A.B. U of I 1913, LLB, 1916; md Madeline Helse Sept. 20, 1925. one daughter Joan Madeline. Admitted to IL bar 1916, and since in practice at Chicago, now member of firm Hinshaw & Culbertson. Served as 1st Lt. Inf U.S. Army - W.W. - Member AM IL State and Chicago Bar Assoc. Sec. of Trial Lawyers, Delta Phi, Delta Sigma Rho, order of Coif. Republican. Author: Hinshaw's Trial Brief (Accidents), Il 1934 (24 edit 1939). Home address: 1936 Chestnut Ave, Wilmette, IL. Office address: 1 LaSalle St., Chicago 2, IL. 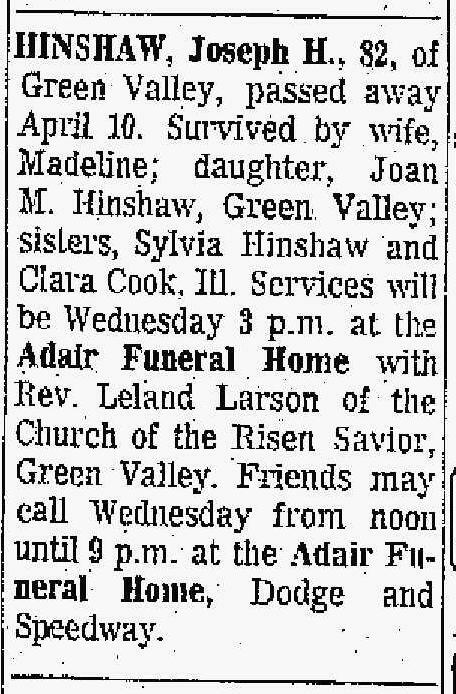 Joseph's obituary was published in the "Tucson Daily Citizen" (Tuscon, Arizona) on Wednesday, April 11, 197312 (see scan below). 1930 census, 49th Ward, Chicago, Cook County, Illinois; roll T626-494, ED 1904, page 28B, line #54, dwelling #63, family #632. 1900 census, Lakeview, 26th Ward, Chicago, Cook County, Illinois; roll T623-277, ED 800, page 16A, line #22, dwelling #200, family #297. 1930 census, 49th Ward, Chicago, Cook County, Illinois; roll T626-494, ED 1904, page 28B, line #56, dwelling #63, family #633. Joseph Howard Hinshaw obituary; "Tucson Daily Citizen", Apr 11 1973; http://www.ancestry.com.